I haven’t mentioned this yet, but a few weeks ago my son’s last gerbil from the group of three he bought in 2009, the one he called Master Tesla of the group Tesla, Marconi, and Faraday (there was an Edison for a time, too) died of some sort of infection and was buried out in our back yard under the Tupelo tree near Csali, our first poodle. 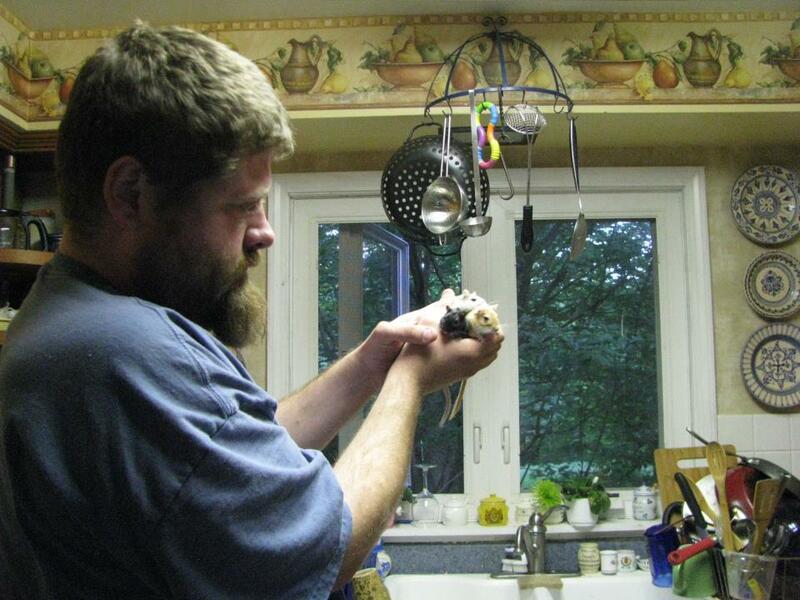 He was an exceptionally intelligent gerbil and very attached to Andy. But gerbils don’t have long lives, unfortunately, only three or four years at best. And one never knows exactly how old they are when they come from the pet store. But now we have another trio of these very sociable animals, a trio of young and surprisingly frisky ones named Maxwell, (black like Tesla and smart, too) Babbage, and Newton. Babbage is gray with a white blaze on his forehead and Newton is blond as Marconi was. They are very cute and I enjoy watching them and talking to them. I’ll try to get some better photos when they are a little older and calmer. Please excuse the really poor quality of these photos through a screened window! 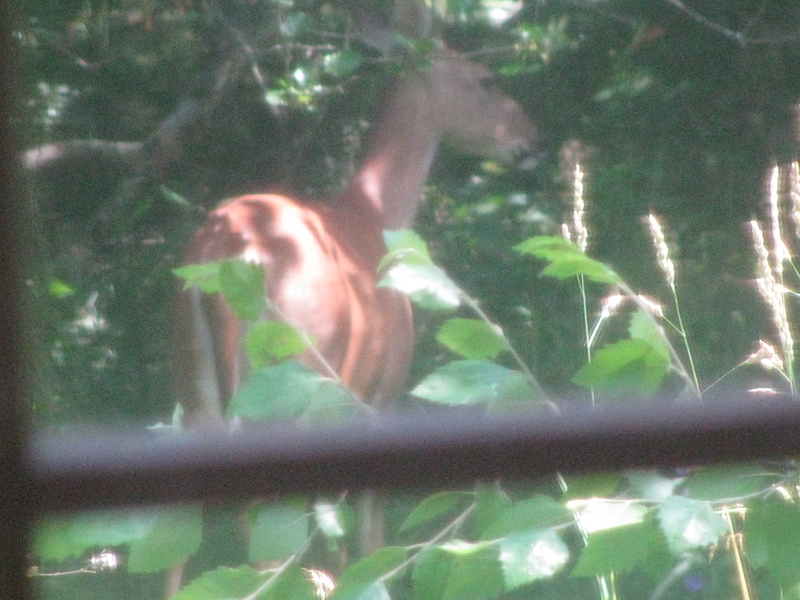 This deer was so close to the house that if I had tried to go outside to photograph him, or even moved to the deck, I am quite sure she would have fled at once. 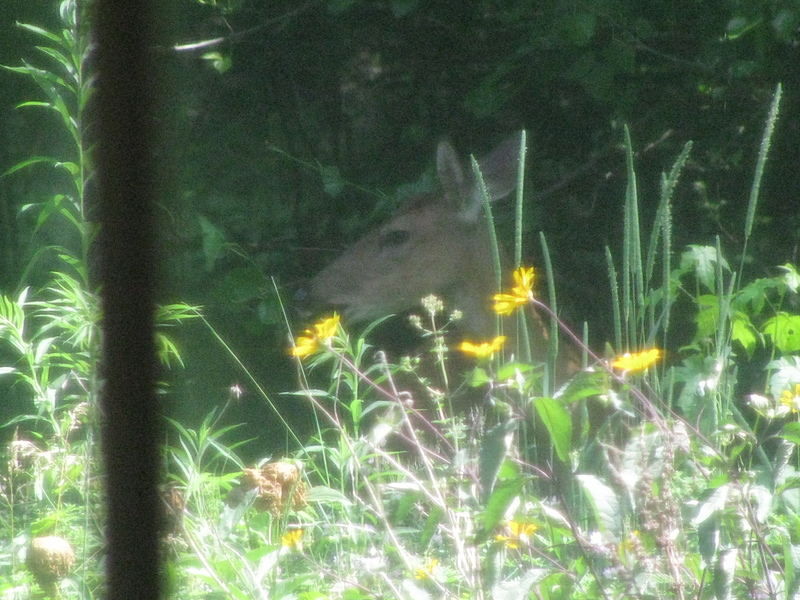 I’ve been seeing a doe and fawn hanging about the yard recently and don’t bother them too much because I’m not really raising vegetables this year, only flowers and herbs on the deck and whatever perennials and bushes are already in the garden. Usually they don’t come this close to the house, although since I’m using zoom here you may not have a sense of how near or far she was. At first I wanted to shout, “Go away!”, as I once would have, but then I realized it wasn’t necessary now, and began talking to the doe in a rather high pitched friendly voice, telling her how beautiful she was. To my amazement and amusement, she began wagging her tail very quickly, just as my dog Bo would have in such a case. 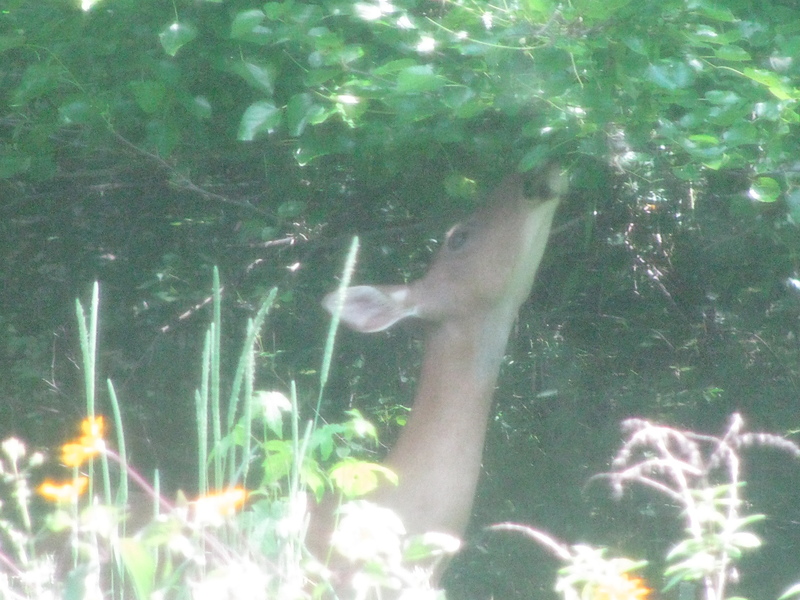 I kept talking to her and she moved closer and continued grazing. 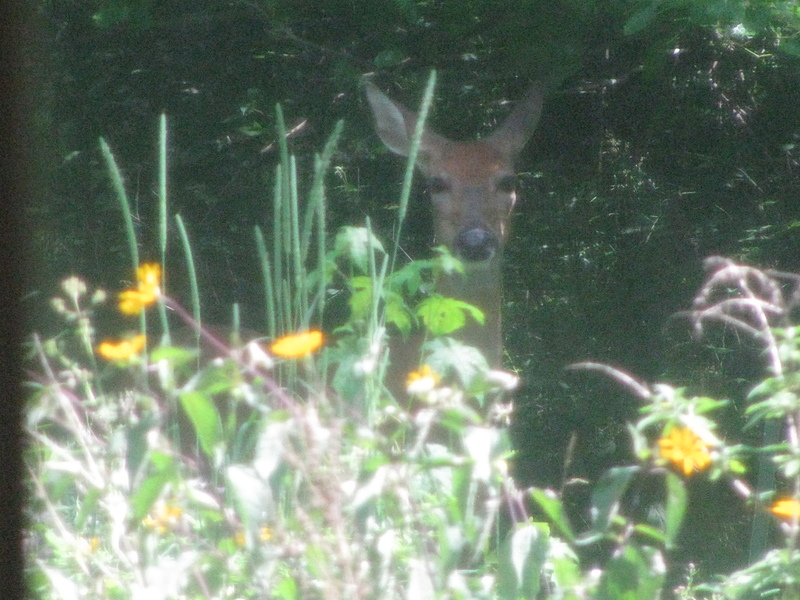 The deer continued munching and looking at me, listening to me sing her praises in that higher tone of voice that animals and babies seem to respond to especially well, wagging her tail as I never realized that deer did. I may be sorry sometime that I gave her this much encouragement. There is a lot of wildlife around here and some I am happy to see and some not. Luckily I haven’t seen the skunks lately, but I have a sneaking suspicion they are not really gone. We have ground hogs, squirrels, possums, deer, skunks, and turtles. I once saw a truck stop on the hill near my house so the driver could get out and assist a slow turtle across the road. It was reported in the local paper . We have chipmunks, moles and voles and deer mice and all manner of lovely birds and insects not so lovely. We have other animals I don’t usually see – toads and frogs, crickets and salamanders and who knows what else……. I am rather happy to have this abundance of life about. Even when woodpeckers are making holes in the siding and skunks are perfuming the evening air. It’s life, and creation and makes my spirit sing. p.s. I fogot to add we have coyotes now. And always had foxes. I’ll see it in person on Monday…..
We’ve had to have a new well pump installed, repairs done on the boat, a new floor in the kitchen, bathroom, hall to laundry room, new dishwasher and new refrigerator. And it’s all done now. Fairly incredible. My daughter Alice is there now with Stephen and the rest of her family and several guests will arrive tomorrow morning. So she has sent me some pictures of the latest work done. And I really like it! 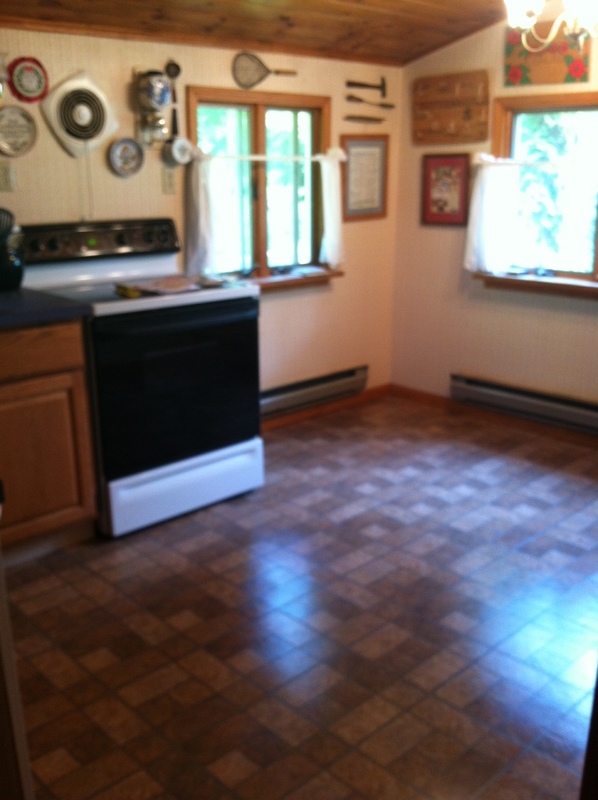 I made a poor choice the last time (in the 80s) for the floor and no matter what we did it looked – well – dingy. I think the new choice will not have this appearance! And from the photos it goes well with the other colors in this lovely old summer cottage, built in 1879, which we bought in 1981, 102 years later. Transformations are a joy. Usually. I will be seeing it on Monday when I arrive. Alice will still be there and the old guests will have left and new ones will be arriving. From 1981 to 2005 I always spent all the summer at the lake, unless we were in Hungary for Sabbatical years.Alice once told me that she was in high school before she realized that all kids didn’t have their Dads home with them for the whole summer vacation. We were so lucky. Paul didn’t teach in the summer, but worked on consulting jobs and rebuilding the cottage, beginning with hand digging four foot deep trenches all around the periphery and down the center under the house. Cement trucks would back up to the front door and chutes would carry the concrete to a trap door in the living room floor. This was for the footers. Then we had to find a man willing to crouch down there and build the foundation wall up to the house. It seems incredible now that we were doing all that and raising little kids and entertaining nearly non-stop guests…..But it was such a joy! A bit tiring, but a joy! Fern Lodge (the name from the 1800s) seems to be a place that makes me more conscious of Paul’s absence than the home I’ve lived in since 1980. I’m not quite sure why. And for the first years after his death we didn’t use it much at all. But we seem to be going there more now and I know that would make him happy. He loved the place so much. We always had a lot of guests, even in the early days when remodeling (much of which Paul did himself, with lots of help from nephews) was just beginning. 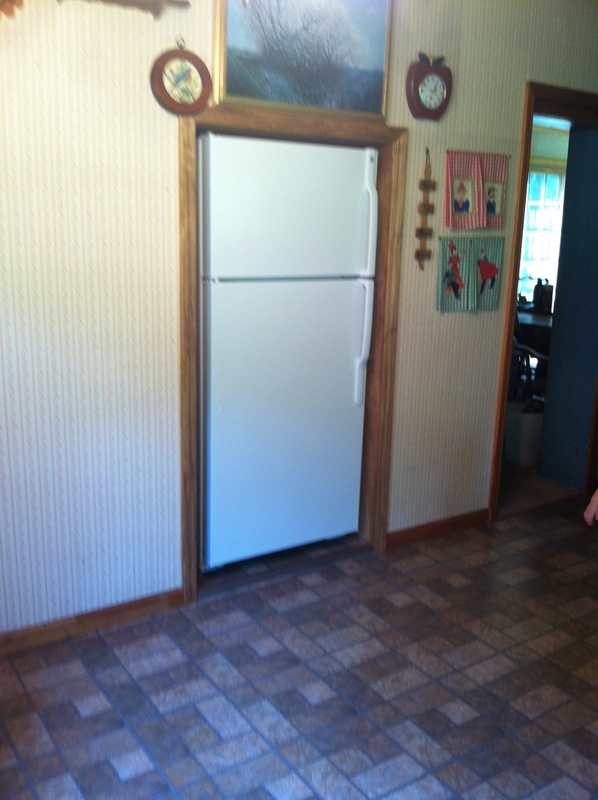 Here is a picture of the new refrigerator which had to have the floor beneath slightly raised, causing the trim to have to be redone. Now we have to rehang the things above it which are not in the right place anymore. 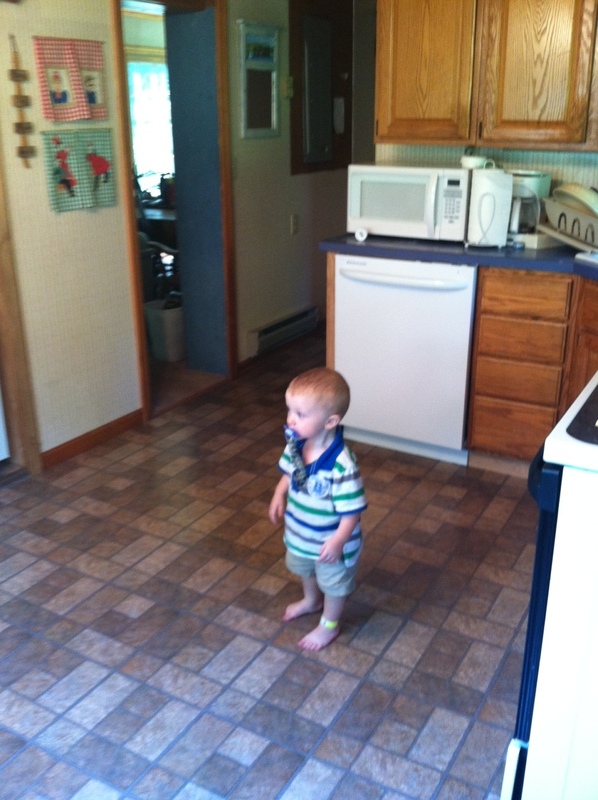 Below is a photo of the new dishwasher with Stephen looked a bit baffled. Those towels hanging to the left of the door are ones my grandmother embroidered and appliqued sometime in the 40a, but rarely used. They went with bridge table clothes. There is also a set with old fashioned high wheel bicycles and cyclists on blue and white gingham. I hope I can remember to take my camera with me when I go, so I can take some more pictures when everything is all together. All those days I was writing about my journey to Hungary I was here in Ohio enjoying a beautiful season of roses……..And now, they are nearly all gone. I used to have many more roses, the old roses I love. And even with nearly a decade of neglect, I still have many. The yellow rose of Texas, Harrison’s yellow, had more flowers on it than I’ve ever seen before. And my beloved Rosa alba Jeanne D’Arc was full of fragrant white roses. Other pink roses whose names I have forgotten bloomed, and Maigold was warmly yellow in the front yard, beside a white Meidiland and a single red Rosa Moyesii Geranium. 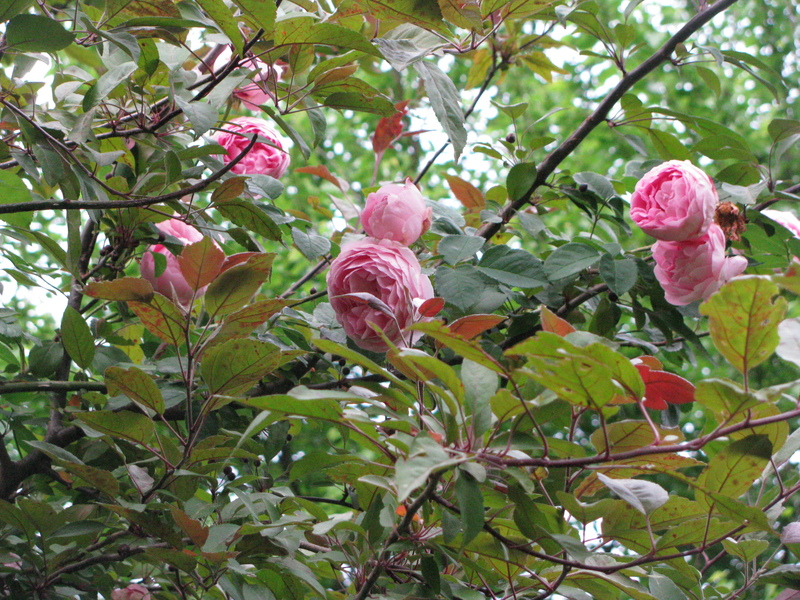 On the east side of the garden a species pink Chinese single rose and a Rosa glauca (which, like many plants, used to have another name when first we met, Rosa rubrifolia) with its gray- blue-leaves made my heart glad. And there are Rugosa roses here and there. So perhaps I have more left than I thought. And though I didn’t go out with my camera as I should have, I did snap a few pictures of my favorite mystery rose which last year leapt up into the branches of a crab apple tree and there still blooms for my delight. 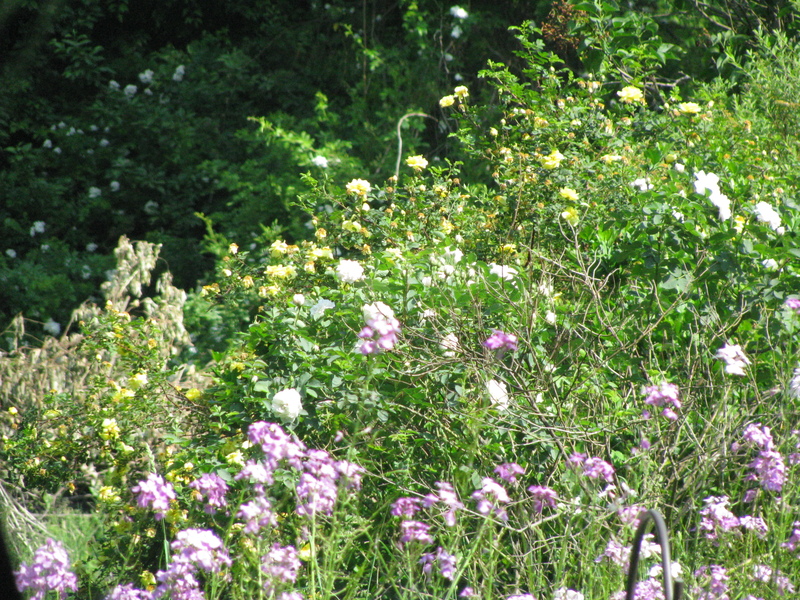 And a strange photo of a few roses (and weeds) close up and I think, honesty in the fore ground. The sad thing about my lovely roses is that I only have “old” roses and species roses and they only bloom once, though delightfully, in June. I really think I must buy a potted rose or two for the deck, a hybrid tea or two, so I have some roses the rest of the summer. They are so wonderful. I have many many more memories, and many many more photographs from this trip – more than 400! But I’m only going to post a few here….Sofia is holding up mother’s day presents for Emily during a celebration at her school. I wasn’t actually there myself, but Em took a number of pictures, and I love the expression on Fia’s face in every one of them….. The next picture is one of many taken from a car, and therefore not the best! (Oh, perhaps there are other reasons, too, such as the deficiencies of the photographer.) It is taken from the Pest side, the east side of the Danube and looks toward Castle Hill across the river. 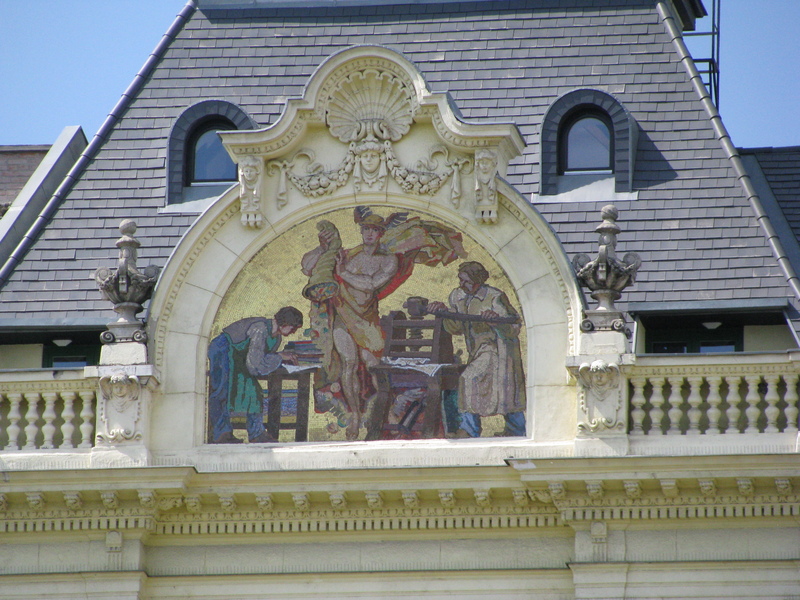 There is a lot of lovely art above doors of churches and public buildings in Hungary or just under the roof. 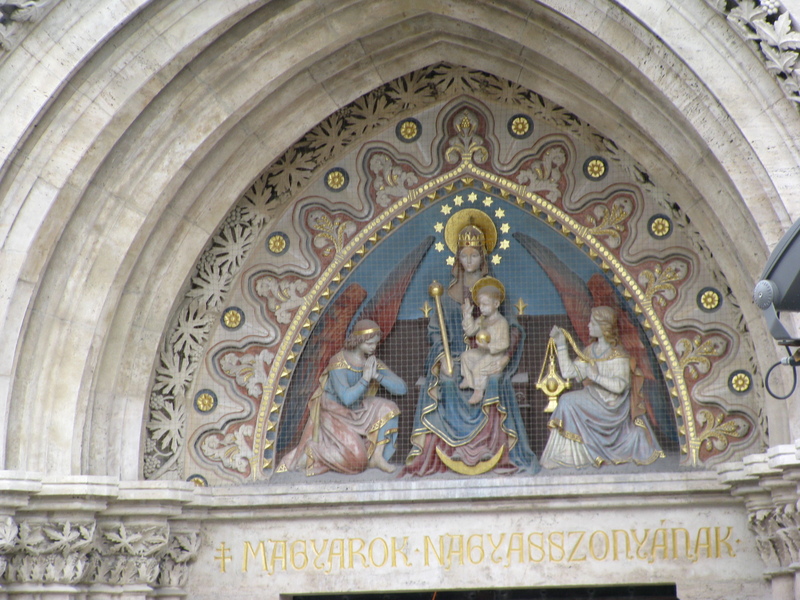 This is Our Lady of Hungary above the entrance to the Mátyás Templom in Buda. And this next one is just a building across from the Central Market. It seems to have to do with printing and publishing books, but I don’t believe the building any longer has a connection to the decoration. 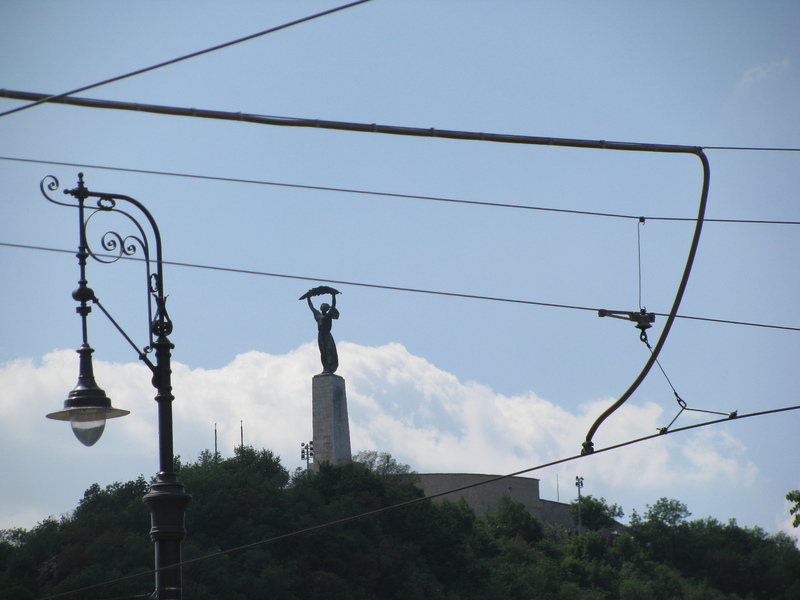 Through a maze of wires, a glimpse can be seen of the statue of Liberty, above the city on Gellert Hill. This was commissioned before WWII, but the communists added several figures of their war heroes to it which I always saw until ’92 when they were removed and sent to the park outside the central part of the city where Hungarians sent all the statues from the communist era. 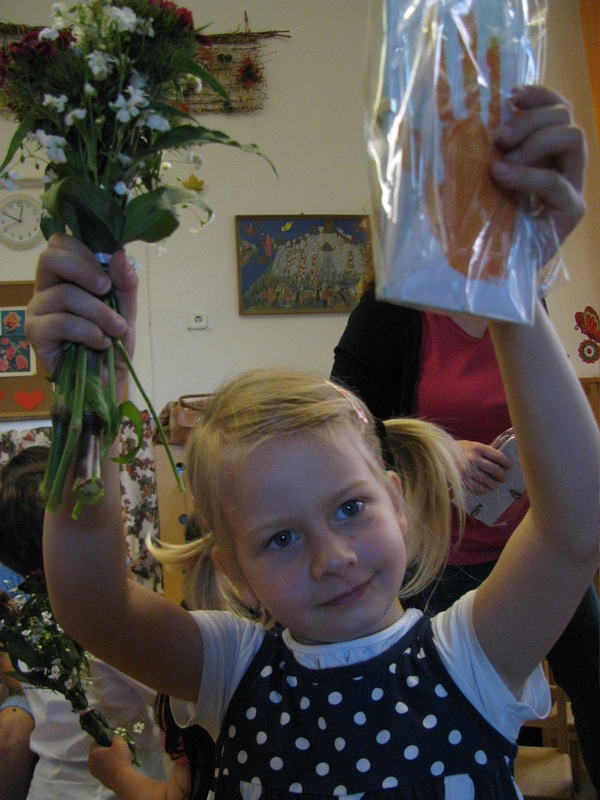 She is holding a palm of victory above her. 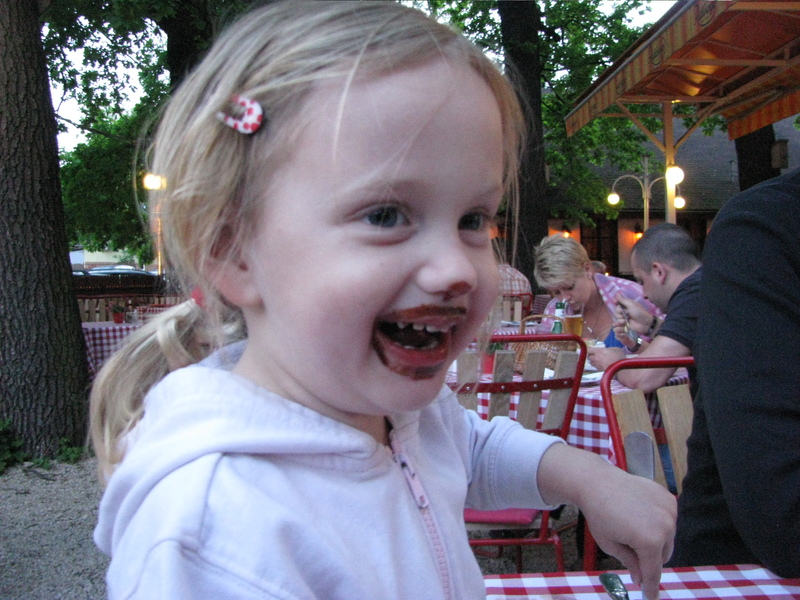 I’m ending with a picture of my other granddaughter, Clara, having a lovely time with her chocolate dessert at Náncsi Néni’s. And finally, that’s the end of my pictures from this wonderful journey there and back again. 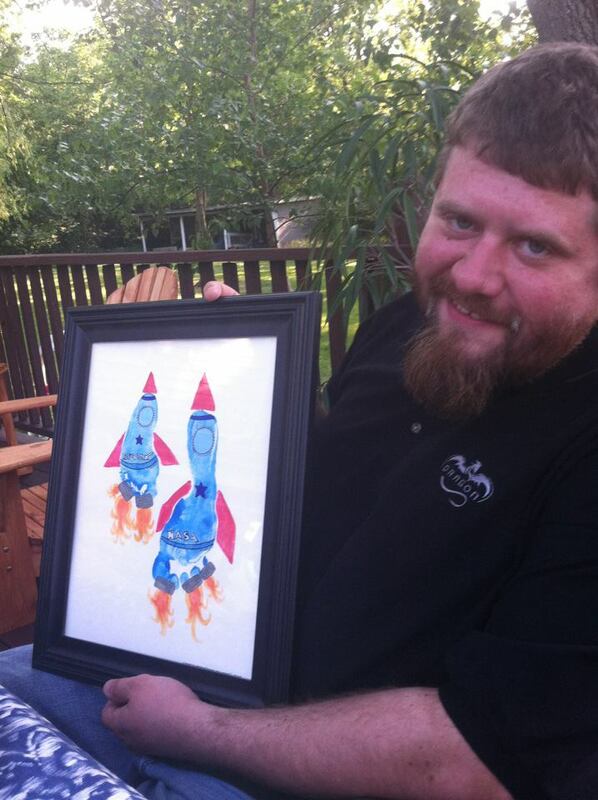 Alice used blue footprints from Nathan and Stephen to make pictures of rockets which she framed for a gift for Andy. He loved it! I may return with a last post about Hungary in the future, but today is the 30th Birthday of my youngest child, my son Andy…. He was in Houston last week with his NASA team delivering some product and meeting the people they work with there. He was able to sit in an Apollo Mission Control Seat and get some astronaut suit training. Regular visitors to this NASA site only see this from behind glass windows. from JAXA, the Japanese Space Agency, at 8:03 you will be able to see Andy in the back on the left. 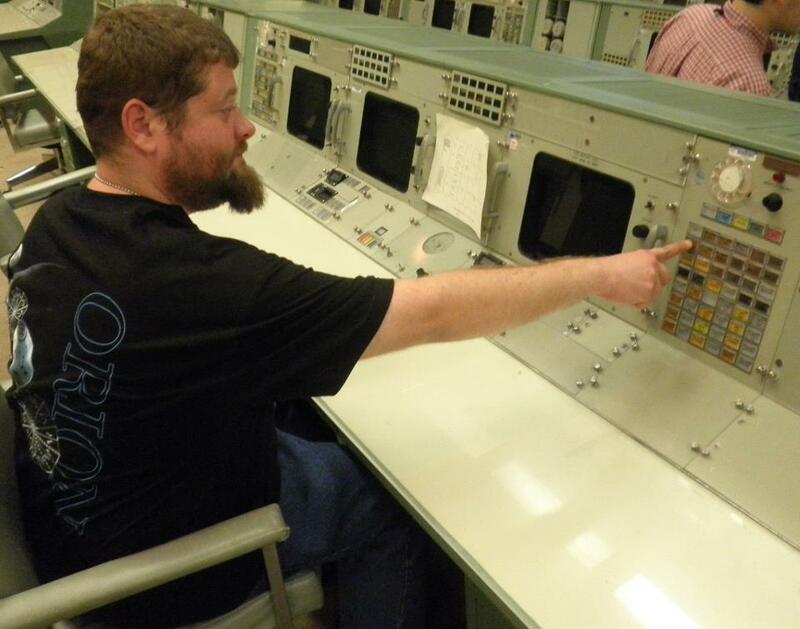 The software defined radios he’s been working on for the last few years are shipping from Japan to the International Space Station in about a month.